Be amazed by the Chocolate Hills, a rolling terrain of 1,268 hills recognized as a Philippine Geological Monument. Be amused by the tarsier, the smallest monkey in the world found only in Bohol. Visit a man made forest, home to rare and endangered flora and fauna. Stop by the Baclayon Church, claimed to be the oldest stone church in the country, blood compact. And to highlight your day, cruise the Loboc River with a sumptuous lunch served on board a floating raft. 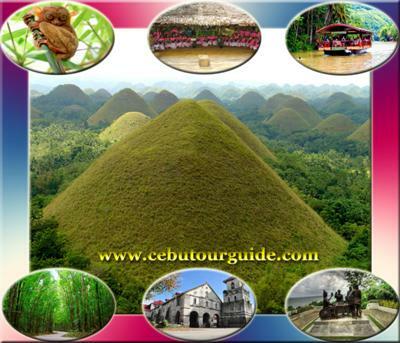 KR Travel & Tours is a DIRECT tour operator company that specializes in Cebu Educational Tours, Cebu & Bohol Hotel Package Tours, Island Adventures and Hotel Booking Services with professional service and consultation.